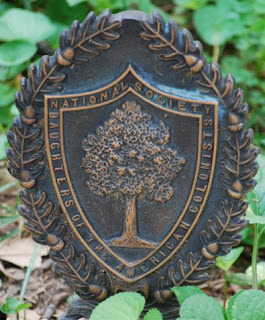 Our next bit of heraldry comes from a flag holder at the grave of a member of the National Society Daughters of the American Colonists and displaying the seal of the Society. The seal of the Society consists of a shield bearing an oak tree in full foliage; the border of the shield bears the name “National Society Daughters of the American Colonists.” Surrounding the shield is an open wreath of acorns and oak leaves, ovoid rather than circular, taller than it is wide. 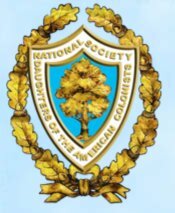 And here’s a color version (in "Colonial Blue" and "Yellow") of their seal from the NSDAC website.